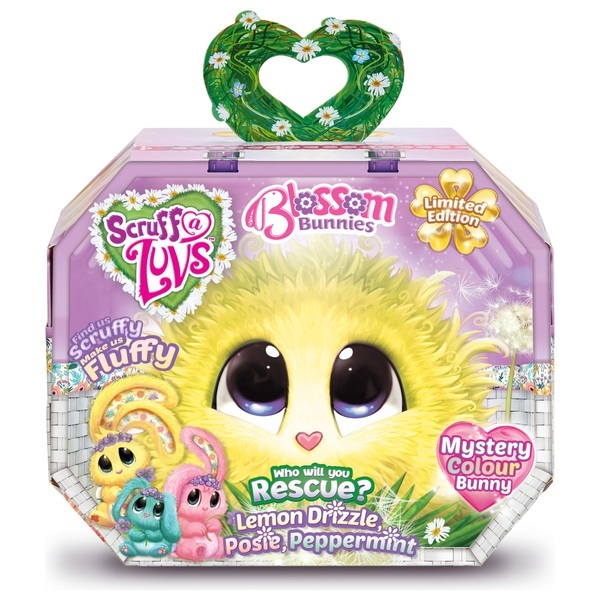 Rescue your limited-edition Scruff-a-Luvs Blossom Bunny and transform them from scruffy to fluffy. Simply wash, dry, groom and reveal which mystery colour bunny you’ve adopted! These unloved and abandoned bunnies need a home in time for spring! When buying your limited-edition Blossom Bunny, they arrive as a sad ball of matted fur, but once you bathe them, dry them, brush them and love them, you will discover which special bunny they really are! Which bunny will you rescue? Lemon Drizzle, Posie or Peppermint? (Each sold separately) Only by saving a Scruff-a-Luv you will find out. In return, they will be your FFF (Furry Friend Forever). Each limited-edition Blossom Bunny comes with a special flower crown accessory, grooming brush and adoption certificate.